All humans require food in order to survive. People get their food from the natural environment through practices of food collection, farming, and the hunting or raising of animals. But food not only nourishes our bodies—food is culturally important, too. We serve food at both formal and informal social activities, such as fiestas, weddings, rosaries, family meals and barbecues. Our preferences for the things we eat are influenced by what our society or culture designates as delicious, appropriate or acceptable. In the Marianas, for example, fruit bat, or fanihi is considered a delicacy, especially when stewed in coconut milk—fur and all. On the other hand, balati, or sea cucumber, which is abundant all over the island’s beaches, is not something most people in the Marianas would place on their dinner tables; however, in countries like China, the sea cucumber is a desirable food item. Culture not only tells us what kinds of food can be eaten, but also how they should be prepared, processed or stored. 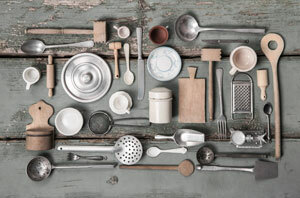 We have recipes for cooking, serving and preserving different kinds of foods. Because of the ways different cultures treat food, we often describe dishes with ethnic terms: Chamorro red rice, Japanese sushi, Chinese dim sum, Italian pasta and so on. In addition, culture provides the context or occasions for which certain foods may be eaten—and by whom. We have traditions, rituals, taboos and other customs that we associate with blessing, sharing, distributing or restricting food. Thanksgiving turkeys, Christmas hams and colored Easter eggs, for example, are part of an American Christian cultural context in which these dishes are given socially important meanings and are served only on those special holidays. In the Marianas, one can argue that food is central to our culture. Visitors to our homes are offered something to eat almost as soon as they walk through the door. Gifts of food are presented at our most festive occasions, like village fiestas and weddings, and at our most solemn ceremonies, such as after evening rosaries or at funerals. In ancient times, Chamorros traded food and provisions with each other, presented food offerings to their ancestral spirits, and used food to help negotiate peace following warfare. Eventually, Chamorros traded food for valuable European commodities such as iron and cloth. Food preferences also change over time. Delicacies from the past may not seem appetizing or practical anymore. For example, fruit bat, as mentioned above, is rarely served today, not only because of its status as an endangered species, but because our tastes have changed. Our preference for Western or Asian cuisine, and even fast food items, like hamburgers, pizza, fried chicken and doughnuts, over traditional foods of the islands, have taken over the dinner and the fiesta tables. And, for better or for worse, our increasingly modern diets have impacted our health. As people of the islands, the Chamorro diet traditionally was rich in fruits, tubers (roots) and foods from the surrounding lagoons, reefs and oceans. Fishing and cultivation of food plants were carried out with simple but effective tools and methods. By looking at ancient Chamorro subsistence strategies we can get a sense of the importance of food in shaping the way people in small island communities adapt to and face the challenges of their natural environment. Food and the preparation of food has always been an important part of the Chamorro culture. We can all fondly remember our grandparents or other family members being very concerned about making sure we were fed and ensuring any visitors to our homes were offered something to eat. We can also recall times family members would come together to prepare dishes for a party or a fiesta. In a similar way, a look at the diet and cooking methods of our ancient Chamorro ancestors will help us gain insight on food choices and methods of food preparation that were used before Spanish colonization. There is very little written about the archeology of Chamorro food prior to Western contact. However, reports from archeological sites, anthropological observations, and journals of visitors during the Spanish era provide information that, when connected, can tell the story about diet and cooking practices. In general, these reports describe the kinds of foods that were readily available in the Marianas, as well as plants that the first settlers or early inhabitants likely brought with them. For example, dokdok (seeded breadfruit), pandanus, and fadang (federico palm nuts) were indigenous to the islands. Meanwhile, lemmai (seedless breadfruit), bananas and sugarcane probably were introduced by the ancient Chamorros. Remains, such as fish bones and shells, indicate the kinds of sea creatures the Chamorros ate or actively sought on fishing expeditions. Evidence from pottery, such as pottery types and food residues, reveals storage methods or cooking techniques likely used by the natives. Changes in pottery styles also give a glimpse of the changing subsistence and settlement patterns of the islanders. Skeletal remains give information about Chamorro health and nutrition. Spanish accounts describe customs related to food, including what kinds of foods were prepared or served at different occasions and the overall importance of food in Chamorro culture. For example, Chamorros were observed serving all their food at one time, as opposed to breaking up meals into different courses. In addition, ancient Chamorros spoke very little, if at all, while eating. Some records claim Chamorros ate a lot of food and ate quickly, while other sources described Chamorros as moderate eaters. Despite these different descriptions, historic accounts agree that the ancient Chamorros valued sharing food. According to archeological investigations at various sites in Guam, ancient Chamorros had good diets and ate nutritional foods. The earliest European visitors to the Marianas described the Chamorro natives as robust, corpulent and strong. Chamorros ate moderately and were, therefore, healthy, strong and lived to an old age. However, some archeological reports also show that islanders had periods of malnutrition and poor health. Archeologists look at bones and teeth because they provide indicators of a population’s health at a given time. Changes in bone can show when an individual or population is experiencing malnutrition, disease or other stresses. In the Marianas, most nutritional stress occurred during periods of famine when food resources were scarce due to seasonal weather patterns, or natural disasters, such as flood, drought, typhoons, tsunamis or earthquakes. Skeletal remains of individuals who underwent such stresses would show defects or signs of improper growth—as well as signs of recovery and healing when resources were replenished or abundant. While Chamorros were not necessarily tall by modern standards, the Spanish remarked upon their height and apparent physical strength. The average height of males based on skeletal remains ranged from 168 to 175 centimeters (about 5’5” to 5’10”) and 152 to 160 centimeters (about 5’2” to 5’6”) for females. Chamorro remains also show areas of large muscle attachments, possibly due to strenuous physical activities that were a part of daily life. Their diets probably had much to do with the general good health of the ancient Chamorros, although they did suffer from certain endemic diseases, such as yaws (a tropical skin and bone infectious disease), arthritis and anemia. Adult tooth samples of both sexes showed signs of betel nut (pugua) chewing. Betel nut was introduced to the islands. It was chewed with piper leaf (pupulu) and slaked lime (afok), a social practice that had little to do with nutrition. However, chewing betel nut seemed to help prevent dental caries (cavities) because of the excess saliva produced while chewing. With its mildly narcotic effect, betel nut was chewed often and generously shared with others. The Chamorro subsistence economy was based on cultivation of small clearings in the bush, as well as food collecting activities in the jungle, and fishing. Some of these activities were scheduled for certain times throughout the year. In the ancient Chamorro calendar, the year (sakkan) was divided into thirteen moons (pulan), similar to months in a Western calendar. Each month was characterized by certain weather conditions or described ideal times for activities related to fishing or farming. The Chamorro calendar, which holds cultural knowledge for seasons and economic pursuits, is still used by today’s Chamorros who fish, farm and/or give cultural advice. In the ancient Chamorro calendar, the 10th moon, or Fanggualo’ was known as “planting time,” or “time to hoe the field.” The 13th moon, or Umagahaf, was a time to catch crayfish. The third moon, Umatalaf, was the time to catch gatafe, or red snapper. The diet of ancient Chamorros consisted of coconuts (niyok), yams (nika and dago), wild yams (gado’), arrowroot (gabgab), and other roots; bananas (chotda), breadfruit—both seeded (dokdok) and seedless (lemmai) varieties—rice, sugarcane (tupu), Federico nuts (fadang), ginger (asno), and different species of fish and other sea foods were frequently mentioned in early accounts of native food. Taro (suni) was a staple, cultivated for both the fiber and the edible leaves. According to a preliminary archeological report by Takayama and Egami in 1971, rice was cultivated in the Mariana Islands, based on archeological studies of 1937 and 1943 conducted in Rota and Assongsong Islands. There was evidence of rice husk imprints on three sherds (pottery fragments) analyzed by another archeologist, Toshya Sato. The sherds predated the arrival of Europeans to the Mariana Islands. Rice residues have also been found on stone pestles in an isolated excavation on Rota. Rice was culturally important and served as a ritual food at different ceremonies, solemn feasts and funerals; it was also an important trade item and payment medium among villages and between islands. Anthropologist Laura Thompson wrote of how rice was the “chief food of the islands,” and Georg Fritz, the first German colonial administrator in the Northern Mariana Islands, wrote that coconuts, bananas, rice, and taro were the only cultivated plants of the ancient Chamorros. Interestingly, the Marianas is the only Pacific island group where rice was cultivated, suggesting a connection between the Chamorros and cultures from Island Southeast Asia. There were no indigenous, four-legged animals in the Marianas. Domestic animals such as pigs, chickens, cats, dogs, pygmy quails, spotted deer, painted quails, goats, cattle and carabao were introduced to Guam during the Spanish period (1665-1898). The only mammals in ancient times were two species of bats: the large fruit-eating “flying fox” called fanihi and a small insectivorous species called pajesjes. Fanihi were relished by the Chamorros as food. Jungle fowl in the Northern Marianas, freshwater eels, freshwater shrimps and coconut crabs (ayuyu) were other sources of food for ancient Chamorros. Seafood was the most important protein in the diet of the ancient Chamorro. Chamorros were expert fishermen who knew different and ingenious methods of fishing. Archeological sites have uncovered many fishhooks and stone sinkers (poio). Fish remains (i.e., bones, scales, teeth and more) have been found, and writers of the Spanish period describe different reef fish and inshore fishes, including flying fishes, mañahak (juvenile rabbit fish), atulai (big-eye scad), lagua (parrot fish), clams, sea urchins, and hachuman (Decapterus sp.) as important to the Chamorro people. The bones of dolphins, marlins, sharks and other deep sea fish have also been found, along with some reports of turtle remains at archeological excavations. Early European explorers and missionaries have written and described foods, fishing practices and fishing gear of the Chamorros. In 1565, Spanish explorer Major Esteban Rodriguez talked about their encounter with Chamorros who came alongside their ship and traded rice, fish, yams, bananas, coconuts, ginger, and other products from the land—all for iron nails, which could be used to make tools, such as fishhooks. Further study of this particular account tells us about the rich resources of the land, the desire for new and different tools and implements, and reciprocity or trade between the Chamorros and others. Other than doing household chores and taking care of children, Chamorro women gathered food in the jungle and on the reef, fished with hand nets, made coconut oil, manufactured pots and cooked with other women. Women were also the ones who tilled and planted village garden plots. They made herbal medicines, and wove mats and other articles to display or store food. Chamorro men also tended gardens, as well as fished, built houses and canoes, worked wood and stone to fashion tools and other implements, and navigated the open ocean on deep sea fishing expeditions. They probably also cooked in the earth oven and made or repaired nets. Although fishing was largely a man’s role, women and children did gather fish and shellfish in the lagoons. Women also worked cooperatively with men in net fishing using the chenchulu (large drag net), the tekken (gill net) and the lagua’ (hand net). Ancient Chamorro society was divided into two different castes: the upper caste was known as chamorri, and the lower caste, mangachang. The chamorri were further divided into two classes: the upper class matua, and the middle class achaot. Some members of the achaot class were matua who had been demoted, and others were assistants to matua. The chamorri lived along the beaches or close to the sea, while the mangachang lived inland in the jungles and hills. Labor among the Chamorros was divided by class. Men of the upper class, for example, built canoes and manufactured shell “money.” Upper class men also engaged in warfare, sea fishing, sailing and exchange. Only chamorri owned land in ancient Chamorro society. They did not use slaves but rather, they had servants who worked the land for them. Mangachang, who could not own land, had to ask permission from the chamorri for the privilege to plant food. They cultivated vegetables and fruits, a portion of which they would give the chamorri landowners. They also were forbidden to fish in the ocean or eat fish and shellfish from the sea, nor could they build or use hooks, nets or spears. Instead, they could fish in freshwater rivers and streams by hand or with clubs, and eat eels (asuli) which the upper classes would not touch because of food taboos. The chamorri also would not eat large-scaled fish or shark, which was considered a dangerous enemy. Evidence of fire has been found in many archeological sites. Blackened pottery sherds (or fragments), earth ovens and rocks that have been set up for fire were found at archeological excavation sites. Evidence of shells that had either been burned or boiled have also been recovered. The main methods of cooking used by the Chamorros was baking or roasting in earth ovens (chahan), boiling in earthenware pots, and roasting on embers (peha). Similar to other Pacific island cultures, ancient Chamorros cooked in the chahan by covering their food with hot stones and leaves and placing them on the embers (peha). Few foods were eaten raw. Mañahak (tiny juvenile rabbit fish) were caught in schools at certain periods, dried in the sun and stored for future consumption. Breadfruit was sliced and dried and could be kept for a long time during periods when the fruit was lacking. Turtle, bats and a small number of birds were eaten, but were not the main source of protein for the ancient Chamorros. Rice was the preferred starch and was husked with a wooden pestle (falu’) in a mortar (lusong). Boiled rice was called alagan. Cooked rice could also be formed into rice cakes, which were used at special gatherings and ritual ceremonies. At feasts, rice and grated coconut was made into a broth or stew called atole, in addition to salted fish. The Chamorros baked root cops, such as dagu (yam) and suni (taro). Coconut milk was drunk in ancient times and coconut cream, made by straining grated, ripe coconut, was used in many dishes, as it is today. Ancient Chamorros preserved food by drying in the sun, salting, or through a fermentation process of soaking. For example, breadfruit and yams would be soaked in the ocean for hours before burying them in underground pits. Lemon or some sort of citrus was available to the ancient Chamorros, and they could easily have chemically cooked their foods. During times of famine, less desirable foods, such as fadang (fredrico palm nuts), pandanus fruit, wild taro and wild yams, were eaten. These foods were considered less tasty and more difficult to prepare and process, and so were reserved for times when more desirable foods were scarce. For example, after disasters like typhoons, Chamorros gathered fadang nuts which were soaked in water to extract the poison, dried in the sun, and ground in a stone mortar for flour, and baked. Many people mistakenly think the intoxicating beverage tuba, formed from the fermented sap of the coconut bud, was present in ancient times. In fact, tuba was introduced by immigrants from the Philippines during the Spanish Era. Detail illustration from the Guam Public Library’s Rare Illustrations entitled Chamorro Customs. The ancient Chamorros used different kinds of tools for fishing and for cultivating and processing different kinds of fruits and tubers that made up much of their diets. Archeologists have found red-slipped pottery and marine shell tools and ornaments recovered from small beach and lagoon-side Pre-Latte Era encampments (1500 BC- 1000 AD). Fishing gear used by the natives, including numerous shell hooks and gorges, points and shanks of hooks, stone and shell weights, and bone needles for making and repairing nets have also been found in archeological sites. The rims of the Tridacna gigas (giant clam) shell were used as scrapers or knives. Late in the Latte Era (1000 to 1521), rice was added to tree and root crops. Larger pottery vessels dating from this period that have been recovered from various archeological sites were most likely signs that the Chamorros were beginning to store food. The ancient Chamorros must have engaged in extensive pottery manufacture because fragments of pottery containers can be found in the jungle, beaches, mountains, and the savannas. Early historical accounts, such as those by Louis Freycinet in the early 19th century, describe three simple gardening tools that are likely similar to the gardening tools used by ancient Chamorros. The dagau and tanum are pointed wooden digging sticks. Dagau was made of the mangrove or gågo and served as a mattock, pick and planting stick, a pole for carrying heavy objects, and as a defensive weapon. Tanum was used for planting taro and for breaking coconuts. The akoa, described to be like a fusiños or hoe, was a 5-foot long pole with a flat, sharp stone three inches wide and 1.5 inches thick, fastened to the wood. One of the most visible ancient objects found at many archeological sites in the Mariana Islands is the stone mortar (lusong), which was used with a pestle (lomok). 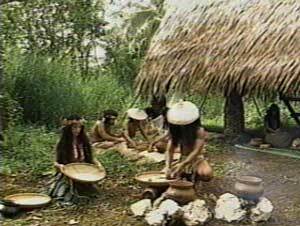 The stone mortar was used to prepare Chamorro medicine and food. This tool was used even up through 20th century, prewar Guam for husking rice, grinding Federico nuts and crushing herbs. Although not found in ancient archeological sites, it was noted in historical records that ancient Chamorros had exceptional skills in plaiting and weaving with various plant materials. Mats and baskets, following ancient models, are still made and used, and, to a certain extent, have been retained. Mats (guafak) were woven primarily by women and could be used for drying rice and serving food. Rectangular baskets (kottot) woven from panadanus leaves were used to present ceremonial offerings or gifts of rice. There were also portable baskets woven to carry betel nut, and larger baskets for carrying weapons and food during warfare activities. The diet of the ancient Chamorro people consisted mostly of tree and root starches, fruits and leaves from different plants and trees. They also ate a variety of seafood, crustaceans, fruit bat and jungle fowl. Archeological data provide evidence that the Chamorro people had a healthy diet and lived relatively long lives. Their use of fire, pottery, tools and other gathering and cooking implements tell us that they had a complex system of gathering, cultivating, fishing, preserving and cooking. The Chamorros preserved certain foods using salt formed naturally from evaporated seawater. Salt water from waves breaking along the island’s coast could get trapped in depressions in the rocky shoreline. The water would evaporate leaving salt deposits behind which could be collected. Asiga (salt) Point in Malojloj may have been one of the places where natives would have had access to natural sea salt. 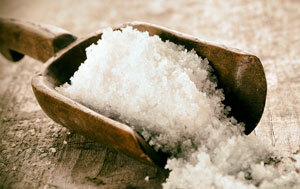 In addition to using it for preservation, salt may also have been a trade commodity.